1. If you recall from my last post, we made a whirlwind weekend trip to the property to deliver a truckload of belongings, and to meet the 30 day maximum between visits insurance requirements. 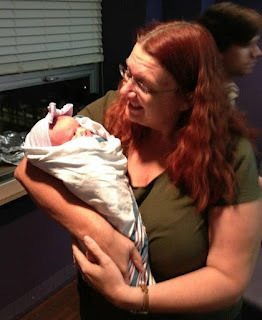 So that put us back in Wisconsin so that I could help our daughter and our beautiful newborn granddaughter. Due to a hard labor and delivery, our daughter was on medical restrictions for two weeks, so I helped out while her husband was at work. 2. We took advantage of this time to also visit with friends and spend some time with our grandson (and his parents) since this is going to be our longest off-grid retreat yet. Our plan is to remain down here until almost Thanksgiving. Scoot packed and ready for her off-grid adventure. 3. We also kept busy preparing for this trip down. Most of these preparations rested with Alan, as I was playing with Baby Hanna at her house. These included: loading the woodburner into the truck, ordering some office equipment we will need down here (more on that when I blog about our off-grid office), going through all our paperwork to determine what needed to come with us for the 'long-term', sorting through all our clothes, and many other little details that needed to be handled. He also picked up the dog's records from the vet as Maycee would be making the trip with us for the first time, and will be boarded down here when we travel back up north at Thanksgiving. 4. Once I returned home, we had one more game of Tetris (AKA pack up the truck), plus we packed up Scoot (our diesel VW beetle) as we would be bringing her down as well. I would drive Scoot while Alan and Maycee made the trip in Truck. A slight delay in the 12 hour trip. We wake up early Thursday morning, pack up the last few remaining items and are on our way. First stop is the gas station in town. I power down Scoot's window to talk to Alan and I hear a 'tinkling' sound inside the door and discover the window will not go back up. If we force it up, it will go part way and then fall back down. At first we decide we will continue as planned and get it fixed down here. I don't mind driving with the window down and it is not supposed to rain, but then I realize this means we also can not lock the car when we stop for breaks. We are not planning any long breaks since we have Maycee with us, but it would still be a pain. So, just 5 minutes into our 12 hour trip and we head back home. Alan works for a bit over an hour tearing the door apart and getting it to the point the window closes all the way, and will stay closed, and we are on our way again. I was not looking forward to the trip as much as usual since we would both be doing the 12 hour drive in separate vehicles. I was looking forward to see if I could join the '700 Mile Club' in Scoot, meaning I had traveled 700 miles on one tank of gas (diesel). 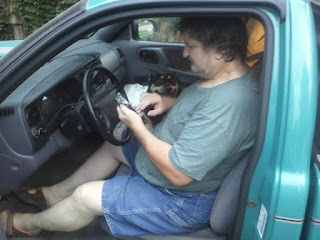 Maycee helps Alan set up the navigation. The trip was fairly uneventful, Maycee seemed to enjoy riding shotgun in Truck and if I had been willing to drive the last 20 miles or so on fumes I probably would have been inducted into the 700 Club. This morning, while unpacking Scoot, I realized she had a lot of extra weight in her and so the 700 Club is still within our reach when we drive back up north this Thanksgiving. Since we got to the property at nightfall, we waited to unpack the truck until yesterday morning. However, we were under a time constraint to get unpacked. We had hoped to get back to the property by August 24 because we wanted to buy some furniture with a 20% discount we had earned, but it expired on the 24th. In a previous post, quite some time ago, I included a picture of Alan building a bistro table and chairs we had purchased at Big Lots. We also bought our bed there and have been pleased with the quality of the furniture, especially since it is so inexpensive. We had joined the Big Lots 'frequent buyer' club and worked to earn '20% off your next purchase' in order to use it to purchase more furniture. We reached our goal a couple months ago, but with our hectic summer schedule and depleting funds for off-grid projects, we had to put off the furniture purchase for a while. But, since we made it back a day before the expiration date, we wanted to take advantage of it. -Back the truck up to the stairs. -Wrap a strap around the stove and pull it to the back of the truck. -Place a sheet of plywood on the stairs as a ramp. -Use another ratchet strap to attach a block and tackle on the deck floor several feet beyond the stairs. -Use the block and tackle to pull the stove up onto the deck..
BTW, block and tackles are not made to pull horizontally so it is a little awkward operating the chain. Even more difficult when the chain links fall between the decking boards and get wedged there, so we grabbed a piece of pressboard from a shelving unit that also came down on this trip to place under the chain to keep it from getting stuck in the decking. Also, when Alan had stored the stove in our garage up north, after our Lehman's trip, he had strapped it to a movers dolly and that was an excellent idea that made the move into the house go so smoothly. So, with Truck now unloaded, we took off the cap to be able to fit more in the truck bed, and headed back to civilization and the nearest Big Lots... We purchased a dining set for the kitchen, several cabinets to use in the bedrooms for clothing & storage, a sofa, recliner, ottoman/storage chest and a kitchen island. We needed to make two trips in the pickup, but it was worth the effort, having saved over $400 and getting everything for around $1800. Now, you need to realized that, like the afor mentioned bistro set, almost everything comes unassembled. 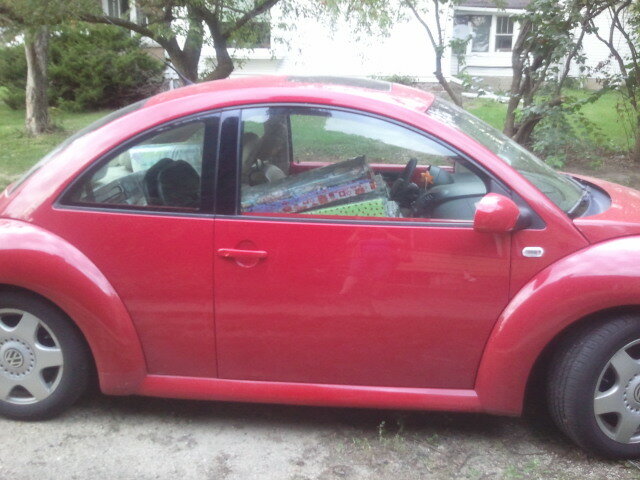 The up side to this is that is is much easier to fit it in the pick up truck. The downside is that the box each item comes in is very heavy, imagine a dining room table that seats six, four chairs and a bench all compacted into a box the size of the table top and about 12 inches deep. For the first load, we simply managed to get all the boxes off the truck and left them on the ground so we could return for load two as quickly as possible. Then when we returned with the second load, it was time to get everything into the house. The block & tackle attached to a support beam by using a ratchet tie-down between the decking boards. onto a mover's dolly before the trip down. We managed to carry some of the boxes into the house, but others were too heavy for us to manage 'as is'. So, we opened the boxes outside, Alan took pieces out of the boxes and lifted them up to the deck and then I carried them inside. The last box, and the heaviest, was the granite top kitchen island. I reminded Alan to open it carefully and not let the box drop as there was a granite slab inside. We work our way through the dozens of pieces that go into assembling this piece of furniture. All the other boxes we had to open had maybe a dozen or so pieces, but this one ended up with well over two dozen pieces that had to be transported from ground to deck to inside the house. By this time we had a good pace going between us so that I was getting pieces into the house while Alan was lifting more up to the deck. The last piece to come out of the box is the granite slab. I know what you are thinking but nope the top of the island is NOT broke, however, it is also NOT granite, but butcher block. They gave us the wrong one. So we call to determine what can be done now that we have torn open the box and carried all the pieces into the house. The store says it is not a problem to bring in all the pieces 'as is'. 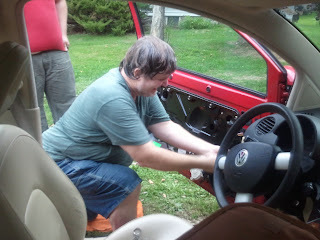 Well, not a problem for them, but we need to reverse the process of getting all those pieces out of the house, onto the deck, down to the ground and then into Rodney (the Kia Sporatge) to take them back for the exchange. At least we got everything else into the house right before it started to rain, well really just a sprinkle, we are still in extreme drought down here. So, that brings us to today's activities. First, of course, was the trip to Big Lots and we verified this box had the correct product number that matched what we purchased. I also noticed on the box that this one weighs 30 pounds more than the one we already carried into and out of the house yesterday. From there we headed to a 'disaster preparedness fair' that was some distance away, but looked like it would be worth the road trip. We thought this could prove to be helpful living in a new part of the country than we are used to or familiar with. Besides, it was free admission and a free lunch. We did have a nice time, found a few interesting booths and a seminar on rain barrels, but the majority was geared towards child safety (including booster car seat give-aways) and tornado safety (including free weather radios). The majority of the attendees were young families with several kids in tow, strollers and babies in front-pack carriers. As we were enjoying our free lunch, Alan commented that it was interesting how you can take the subject of disaster, death and destruction and turn into into a family oriented fun fair that includes face painting and balloon animals! That's all for now, it's getting late and tomorrow we need to get up bright and early for another road trip back to civilization and the nearest Harbor Freight for one of their parking lot sales. Now that is something to get excited about! The amazing Hanna Rose with Grandma. It took us almost a month to get back to the property and it is going to be a very short stay. We arrived about noon today (Saturday) and leave to head north again tomorrow morning. Why the short stay? Because we had to rearrange our schedule a bit based around the birth of our granddaughter! Our original plan when we headed north last month was to stay up north for a week or so after Hanna Rose was born so I could help my daughter get settled at home when her husband works 12 hour night shifts (He is a 911 dispatcher). Well, Hanna decided to be more than a week over due and we had an obligation down here we had to meet before the 13th, so while waiting for Hanna we came up with the new plan - bring a truckload down a couple days after the birth and make a quick return to be available when Hanna's dad has to return to work next week. This plan actually works out well because we are now fitting in one more trip down with the truck than we had planned this fall. We didn't buy too much to bring down on this trip, we mainly packed the truck with things we already had waiting to come down along with some household items and clothes from up north. We did buy Truck a new set of tail pipes for the trip as he has managed to knock one or the other loose on each of our previous trips (we have now broken 3 pipe hangers). Our mechanic made up some custom pipes, moved the muffler, and welded and cross-braced everything! I am also including a picture of a new game we bought to add to our collection down here, I thought the name of it was very appropriate. One other purchase I am proud of is yet another 'Oops' from the Home Depot paint department, yes I was checking them out up north as well. I found four various gallons ($5 each) to use, but the best was a 5 gallon bucket of Behr deck stain that retails for about $150 and I paid just $20 and it is a dark stain like I had found for the deck stairs. Hopefully 5 gallons will cover the entire deck, if not I will need to get creative. Charge controller showing batteries fully charged! The rain water trough outside the bathroom window is full! As we were driving through the nearest town, we were wondering how the water level in the river would be compared to last month. The last time we were here, we kept watching the water level drop in a local swimming hole at that river. When we originally came down to look at the property this spring, the water was flowing over the dam next to the swimming area. On the next trip, the water no longer reached the dam and on the last trip the level had visibly dropped each time we drove by it. We had heard there had been several rain storms while we were gone so we figured the level would be up a bit. We were wrong. 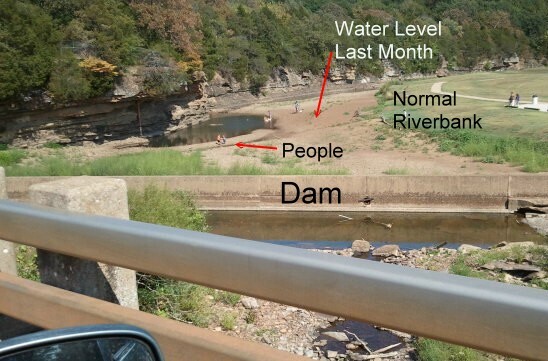 This picture above was taken from the bridge and shows the dam and what is left of the swimming hole. We went for a drive tonight during the 'Golden Hour', that hour in the morning and again in the evening when the sun casts long golden shadows that photographers love so much. On our road we saw 50 deer, and on road we had not explored before we found a herd of buffalo! Alan got to see a road runner this time too!